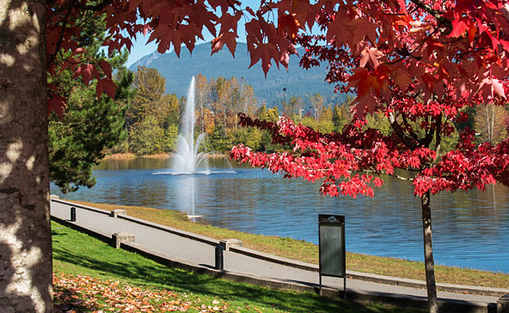 The ﻿Tri-Cities ﻿are an informal grouping of three adjacent suburban cities and two villages in the north-east sector of Metro Vancouver in British Columbia. 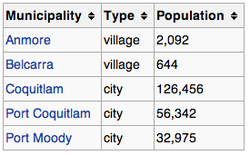 Combined, these five communities have a 2014 population of 218,509 residents. For motorists, the Trans-Canada Highway provides freeway access to Burnaby, Vancouver, Surrey, and other municipalities in the Lower Mainland. Lougheed Highway is an alternative route to the Trans-Canada, entering Coquitlam through Maillardville, past the Riverview Hospital area, up to Coquitlam Centre where it turns sharply east to Port Coquitlam and then into Pitt Meadows via the Pitt River Bridge. The Barnet Highway in Coquiltam heads directly west through Port Moody and on to Burnaby and downtown Vancouver. Bus service in the Tri-Cities is provided by TransLink. The West Coast Express, which runs from Downtown Vancouver to Mission stops at Port Coquitlam Station, Coquitlam Central Station and Port Moody Station. The Evergreen Line is a rapid transit line currently in the early process of construction. It is tentatively scheduled to open in 2016. It will run from Lougheed Town Centre in Burnaby through the southwestern part of Coquitlam into Port Moody and then into central Coquitlam where it will terminate at the Coquitlam Town Centre. When referring to schools, residents commonly refer to the Tri-Cities as "District 43," after the public school district that serves this area. The three Canadian city names are also often conflated into "PoCoMo." The Tri-Cities area has access to a wide variety of media available in the Lower Mainland. Several community newspapers provide local coverage, including the Coquitlam Now and the Tri-City News. CKPM-FM in Port Moody is the first radio station dedicated to the Tri-Cities area which took to the air in 2011. Businesses in the Tri-City area are represented by the Tri-Cities Chamber of Commerce.